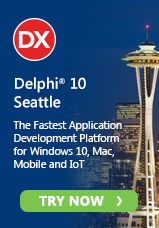 With the great success of the inaugural event in 2009, Delphi Live! is coming back to San Jose from August 23-26. We are looking forward to another great gathering for Delphi developers from all over the world and to meeting you again in that area where Delphi history has been written – and we want to celebrate with you, of course, Delphi’s 15th birthday! Please accept our invitation to submit session proposal for this great community event. Here is some basic information as well as the Call for Papers! If you already have a log in to this website, you can use it. If not, registration only takes you a few seconds. Sessions are 75 minutes. It’s possible to divide a session in an introduction and a sequel. 1. Accommodation will be covered based on the contribution of each speaker to the conference. 2. You have free access to all sessions and tutorials. 3. It is mandatory for each speaker to give at least 2 talks. We are looking forward to meeting you in San Jose!